Golf is a "green opium", jokes Li Xiaoming, who played the sport almost every day in the year that he was most fanatical about it. Li, a 52-year-old Beijing businessman, has been hitting the links for more than 16 years. He was an amateur golf champion and played in the China Open, a men’s golf tournament that has been held annually since 1995. "But I was not interested in going to golf courses at all at the very beginning because I regarded it as a game for the old," Li says. However, a friend persuaded him to have a try. They went to a golf course in Hainan province and, Li found himself enchanted by the course’s natural scenery. "I was out of breath after I played nine holes and had to sit under a tree for a rest," Li says. "The amazing thing about golf is that it’s like participating in a psychological war with your rivals. It’s a battle of wits and courage." Li spends 100,000 yuan (11,510 euros, $15,640) a year playing golf and has lost 10 kilograms over the past decade. "Although I am in my 50s, I feel no difference in terms of health from when I was young," the tanned man says. A growing number of Chinese have developed a strong interest in golf. In Beijing there are about 65 golf courses and more and more people are using them not just for sport but as a social activity. The average price for playing 18 holes in the capital is between 600 and 800 yuan but play at most clubs is restricted to members. "At the weekends it is really hard to make a reservation at golf clubs that lie within the Fifth Ring Road in Beijing," says Yang Yue, a golf enthusiast. "Usually we drive to Langfang or Zhuozhou (in Hebei province) to find a golf course that is not that crowded." Chang Zhihui, a researcher with the golf education and research center at Beijing Forestry University, estimated 600,000 people on the mainland are golf club members. The figure is expected to increase by 20 percent annually in coming years. Beijing, Shanghai, and Guangdong, as well as Shandong and Hainan provinces, are the top five golf destinations in China, with about 600 golf courses in total, Chang says. The venues reflect the places where there are the highest number of millionaires. According to the Hurun Wealth Report co-released in April by Hurun Research Institute and GroupM Knowledge Center, Beijing was the area with the most multimillionaires. Guangdong province ranked second and Shanghai third. The report says the number of Chinese multimillionaires was rising beyond people’s expectations – about 960,000 people on the mainland are worth more than 10 million yuan, including 60,000 people worth 100 million yuan. "In the past, golf players were usually successful businessmen and chief executive officers, but now more and more white-collar workers are trying the sport," Chang says. If people have a monthly income of more than 10,000 yuan, they can afford some rounds and, therefore, become target clients of golf clubs, he says. However, of China’s huge population base of 1.34 billion, the number of Chinese golf players accounts for less than 0.1 percent. In some developed countries, such as the United States, the figure is 10 percent across its total population. "That indicates an enormous growth potential for China’s golf industry," Chang says. The strong demand has prompted rapid construction of golf courses, something that some have been critical of because they occupy valuable land resources and use a lot of water. Grass on golf courses can require as much as half a ton of water for every square meter annually. "An 18-hole golf course, which usually occupies a total grass area of 300,000 to 400,000 sq m, could probably use 150,000 to 200,000 tons of water a year," says Han Liebao, executive deputy director of the golf education and research center at the Beijing Forestry University. 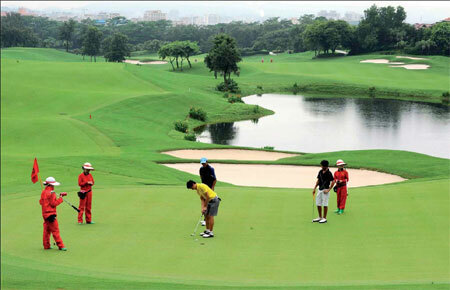 In 2004 the State Council forbade the construction of new golf courses. However, the ban has been violated and hundreds of new golf courses have emerged during the past seven years. Most are euphemistically called sports or leisure clubs. In June this year 11 Chinese ministries collectively ordered new checks on all golf courses to prevent illegal land use and seizures and to ensure no loss of farmland.